Call 440-333-5984 for appointment or to discuss your individual instrument needs. My primary focus is instrument repair, set up, adjustment and restoration. From complete re-assembly of historical instruments to the set up and adjustment of everyday instruments, the goal is optimal tone and playing comfort. This attention to detail assures the set up and adjustment is customized to the distinct qualities of each instrument and is based on the performer’s unique musical expression, technique and tonal goals. 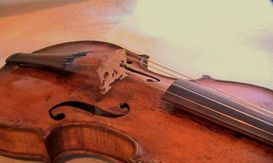 Conversion of instruments for Baroque performance means working with a budget and instrument to develop an instrument to meet the performer’s requirements. From historically accurate models to ones more comfortable to the modern player wishing to explore Baroque performance, available services include: exterior work with fingerboard, tailpiece, bridge and strings to more involved work with structural changes to bass bar, plate tuning and neck length. I also work with Early Music instruments in the lute and gamba families, as well as other unique early forms of instruments. I stock a variety of instruments and bows in various price ranges. More are added either from suppliers I trust, recently completed restoration projects or new consignments. My suppliers are evaluated primarily on quality of product, balanced with cost so that I can confidently represent these fairly to teachers, students, parents, amateur or professional players.